Way of the Samurai 4 is a weird game. This shouldn't surprise, as the whole franchise has rightly earned its reputation for being weird, quirky, and all manner of labels used to identify Japanese games. That said, like its predecessors, Way of the Samurai 4 offers an experience that is quite unlike almost anything else on the market, one unreplicated since the PS2 era except by other Way of the Samurai games. Unfortunately, the franchise's monopoly on that style of play has made developer Acquire complacent, content to issue incremental updates rather than to work on fixing the series' flaws. These flaws, as well as a few new decisions that may divide even sympathetic fans, will once again doom Way of the Samurai to the niche of obscurity, the fourth time it will be distinguished -- and subsequently dismissed -- as a weird, quirky, love-it-or-hate-it Japanese game. For the uninitiated, Way of the Samurai games, (this one included) are best described as structured, samurai-themed takes on the open-world genre. Each installment drops players into the toe-socks of a nameless wandering samurai making his way through some place embroiled in factional turmoil. The crisis this time is on the island of Amihama in the 19th century, as foreign powers arrive in Japan and crack its three-hundred-year isolation. And with upheaval comes conflict. The British and their "Black Ships" are here to spread trade, guns, and English. The shogunate magistrates are out to exploit the chaos for fun and profit. The xenophobic Disciples of Prajna plan to expel the barbarians at sword-point. Over the course of five days in Amihama (it's longer than it sounds), players are free to tool around Amihama, aligning themselves with one faction or another, doing odd jobs, simply sleep the week away, or even just turn around and leave town seconds after they arrive. All are equally valid options. That said, the plot itself lacks some of the personal touch that characterized earlier games. Few attempts are made to develop the various faction characters, and it becomes difficult to get attached to any particular side. A somewhat creepy sideplot involves adopting a foreign girl (who has a crush on the player) as a little sibling, but otherwise few characters truly endear. Way of the Samurai succeeds where many other open-world games fail in that it manages to convey the feeling of a place that has a life of its own, rather than a static space that exists at the player's leisure. It may not have the vistas of Skyrim or the geographic distinctiveness of Liberty City, but Amihama feels like a real locale, one that can -- and will -- go on, whether one cares to act in it or not. That puts the onus on the player to really make their mark on the world -- or not. Players will go about making that mark mainly by encountering various events scattered about town over the course of their adventure. The events, which are marked on the map (allowing players to avoid them if they choose), range from full missions to short cutscenes, and most involve making one decision or another, the outcomes of which determine what events come next, leading to one of ten distinct endings. The game doesn't list when or where specific events happen, but the in-game journal tracks previously visited scenes in a flowchart, making it easier to follow which events lead to which endings. Averaging at about 3-5 hours per playthrough (assuming one goes for "proper" endings each time), Way of the Samurai 4 is clearly intended to enjoy over multiple replays. In fact, it takes the concept of persistence in an interesting direction. Some plot events (and their consequences) can remain even after the game loops around. For example, the first time through, players will be completely unable to communicate with foreign NPCs. However, once a mission is completed to open a language school, the foreigners start to speak English, instead of "!!!?!?!?!". Recruiting certain characters for the dojo or to run the shop remain as well. 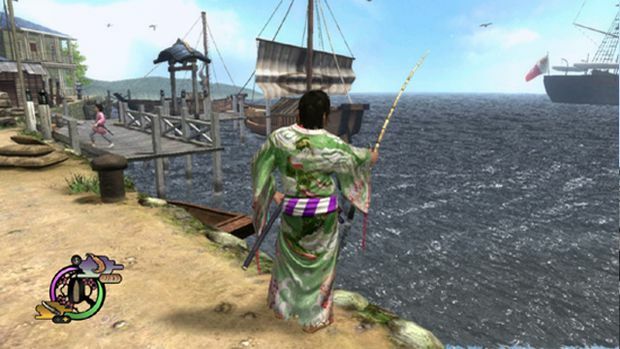 After each playthrough, players are given a "Samurai Rating" monitoring their decisions, and are awarded points that can be used to buy unlocks, including new outfits, accessories, the ability to change gender (though the game still treats the player as male), and other strange objects, including a wearable tutu, afro hairstyles, and the clothes and appearances of various generic NPCs. Side quests also abound in Amihama. Players can take on odd jobs to accumulate cash, take over a dojo and recruit students -- by beating random passers-by half to death and telling them "You're my pupil!" -- seduce women and engage in a fairly disturbing "Night Crawling" minigame that involves sneaking into their houses to spirit them to the nearest inn. Crime is also handled interestingly. Offending players captured can be tortured by the authorities via a waterboarding minigame (implemented humorously), and surviving repeated sessions can endear them to certain sadistic ladies. Night Crawling and dragooning potential dojo students are just some of the strange and characterful escapades permeating Way of the Samurai 4. The game sells a somewhat strange idea of freedom. Instead of being free to roam anywhere and take one's time while the world waits, players are free to, within the confines of the game's structure (its time limit and story progression) act as they will, even if they want to act silly. Players are free to interrupt dramatic cutscenes by heckling the participants or asking inane questions like a college student yelling "Wooo!" at a commencement ceremony, or draw their swords and provoke a fight. They can slay quest givers and even the NPC photographers that serve as save points. Stealing isn't so much an act of stealth as it is buying something and running away without paying, as the shopkeeper hounds one down, attempting to kick the player in the shins. XSEED's localization also underscores how silly the game is at heart. The company has opted to translate and localize most of the game's ridiculous puns, revealing sword styles called "Cantgetmi" and "Penetrator," and characters like "Laurie Lita," "Jet Jenkins," and "Melinda Megamelons" (!). Folks hoping to treat the game like an open-world Yojimbo will have difficulty taking Way of the Samurai 4 seriously. Silliness aside, the meat of the game which lies in its combat and crafting system. 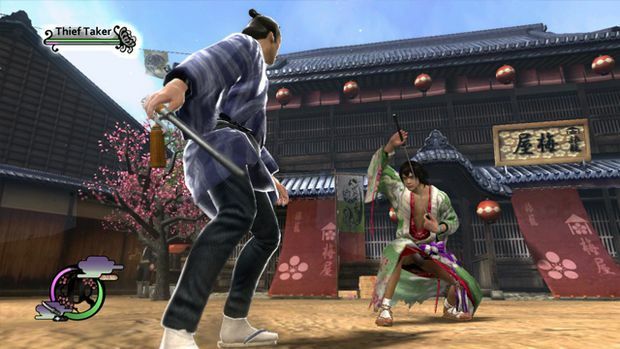 Amihama practically overflows with swords and spears, and players will spend a considerable amount of time collecting them and dozens of distinct combat styles that come with them. Styles range from upper stance forms to the infamous "Iaido"-style draw stances. 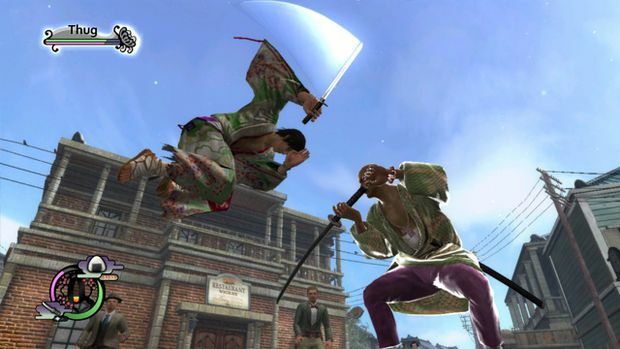 Individual moves are unlocked in an achievement-like system, such as unlocking a particular strike by kicking an enemy to death, or eating food during combat. Learned moves can eventually be combined together to create a custom style, so unlocking as many moves as possible is encouraged. Unlike previous games, styles are no longer locked to specific weapons, and any style can be used with any weapon. This frees up players to concentrate on collecting swords to disassemble for parts, assembling their ideal, signature weapon. Way of the Samurai 4 has also made some changes from previous systems, introducing a form of regenerating health to the combat. Players have both "vitality" and "health." Vitality is drained by attacking and travel, while health can only be lost in combat. 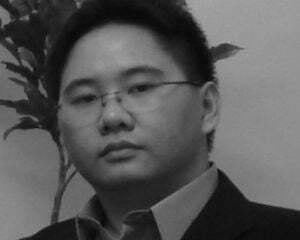 So long as a player has vitality remaining, health will regenerate. Various items such as food regenerate vitality. Enemies also use this system, so fighting tough foes often involves beating them with the flat of one's blade to whittle down their vitality (and thus their regeneration) before switching to lethal strikes to finish the job. Also added is the "Spring Harvest," a gauge that fills as players kill enemies and take damage. Triggering the Spring Harvest slows down time and removes all recovery and break animations, allowing players to infinitely string together rapid strikes and make short work of entire groups or tough bosses. Sadly, the "One-Hit Kill" difficulty setting has been removed, and the ability to automatically kill an enemy after a counter is gone. As a result some boss fights tend to drag, and folks who regard the series as a Bushido Blade RPG will be disappointed. The game also maintains some rudimentary online connectivity in that players can upload their characters to the network and have them enter other players' games as wandering duelists. Defeating such characters can net copies of that player's sword, and exceedingly powerful weapons can be encountered. That said, I have yet to encounter another player's avatar at all. For all this character and uniqueness, Way of the Samurai 4 unfortunately stumbles in the same place as its predecessors, in that it fails utterly to communicate its strengths. Players without the dedication to stick it out or explore on their own will only see an awkward, rough-hewn action game with a pointless open world. It doesn't help that nearly all the game's systems are undocumented, barring a few combat tooltips at the beginning. Newbies to the series should either be plugged into a walkthrough or have a helpful fan to guide them along. 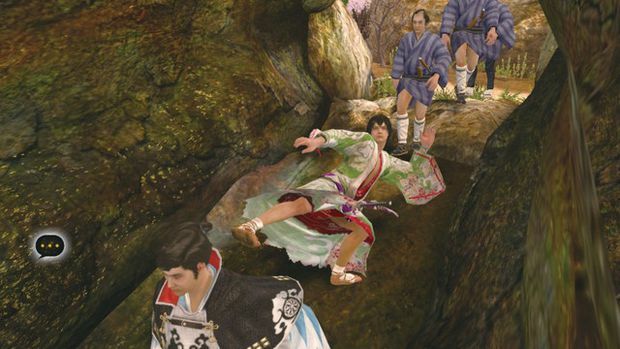 The rough edges also creep into the combat, as it can be quite difficult to perform particular combat achievements (such as kicking an enemy to death while lying on the ground). Visually, the game does little to stand out, and looks like a mid-generation PS2 game at times. 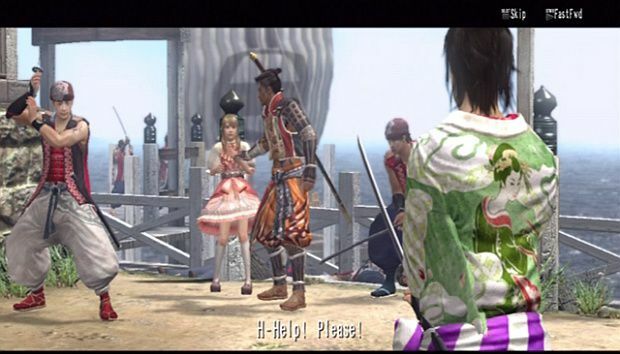 The various characters' animations are exaggerated and theatrical, as the lack of voice acting for most characters (subtitled Japanese) forces most to pantomime their emotions and sentences. It all looks hilarious, but may turn off graphics nuts. 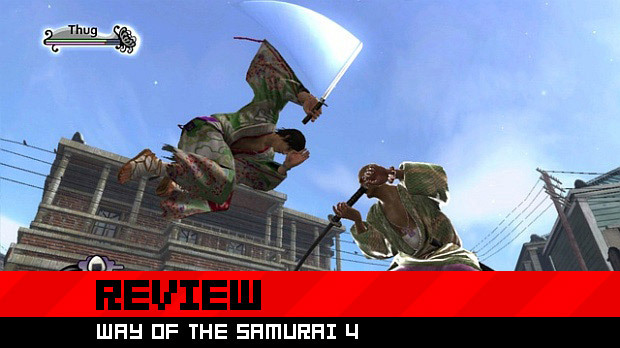 In the end, and like its predecessors, Way of the Samurai 4 is an "acquired" taste (pun intended), and tends to demand that players give a little to get the most out of it. Unfortunately, most players won't, once again dooming it to the ghetto of niche interests and "quirky" Japanese titles. Those willing to stick with the game, however, will find a unique, rewarding experience that to date, can't be found anywhere else.